Meet Hiriko, an EV that's the fruit of a collaboration between MIT, Basque businesses and the Spanish government. It might look like the rest of those sci-fi Jetson-style concepts, but it has a few tricks up its wheel-arches. Rather than a regular configuration, the bubble-esque ride has four independent in-wheel motors. Also, when you're ready to park this thing, the back section slides forward, "folding" the cabin up vertically -- a feat the makers claim will see it occupy only two-thirds of the space taken by a Smart ForTwo. Other neat features include a single front-opening door and joystick controls (rather than a plain old steering wheel). There's no details on range, mph and charge speed, but 20 test vehicles are being built at a reported cost of $16,253 each. There's no hint at what this will translate to in sticker price when it goes into production next year, but with the initial trials taking place imminently, it looks like Hiriko (meaning "of the city") could be a feature in your city quite soon. 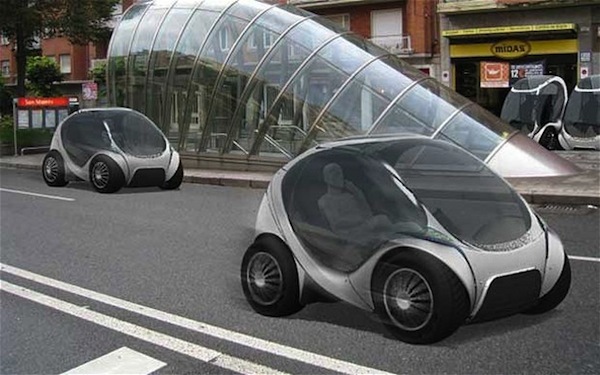 Hiriko: The MIT-backed, Spanish 'folding' EV that wants to make cities bigger originally appeared on Engadget on Thu, 26 Jan 2012 01:26:00 EDT. Please see our terms for use of feeds.